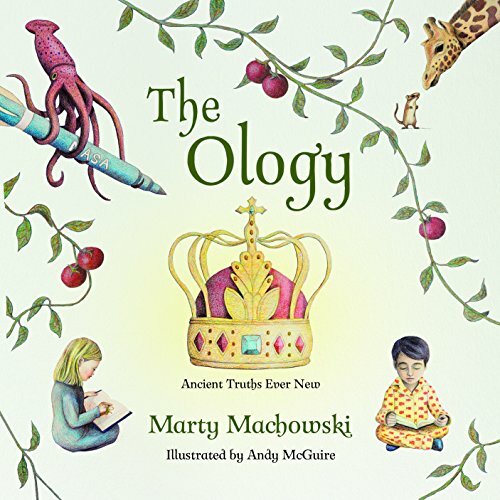 A few months ago, I posted about the new children's theology book, The Ology: Ancient Truths Ever New, by author and pastor Marty Machowski. The release of the book is now about a month away. One of the things I love most about the book are the beautiful illustrations by Andy McGuire. I recently had the opportunity to correspond with Andy. Here are his answers to my questions. Jared: Can you tell me how you first got involved with illustrating The Ology? Andy: I’ve been illustrating for years, and have written and illustrated four picture books and created freelance illustrations for several others. Three or four years ago I gave a postcard advertising one of my picture books to Mark Teears, CEO of New Growth. The postcard worked its way over to Barbara Juliani, the editorial director at New Growth, and she contacted me. Barbara believed my illustration style was just right for the book, and we negotiated from there. Jared: The Ology is a really big book. What was the illustration process like for you--working with Marty (and maybe even a design firm)? How long did it take? Andy: You’re right—it is a big book. The biggest I’ve ever worked on. I was given about a year and a half to work on the illustrations, and it took me nearly that long. Marty, Barbara, and I spent several months going over what we wanted on each page. Marty had some ideas for most of the pages. I’d create sketches from those ideas or come up with some on my own, and then I’d send them to Marty and Barbara for their thoughts. Some of the sketches were approved right away, while others took several steps to figure out what we wanted. Theological concepts can be tricky, at times, to turn into concrete images. Jared: With what kind of medium are you working? Is it colored pencil? Do you always use that medium? Andy: I start with a light wash of watercolor and then use colored pencil for the detail work. The wash of watercolor shows through to give it a richer, more finished look. I created the pictures on illustration board, which is kind of like poster board but with a nice, textured finish that holds pencil well. The colored pencils I use are just a Crayola 12-pack (the kind you can get at Target :). I don’t like to mess with more colors than that—I prefer to mix my own shades from there. The combination of water color and colored pencil is my preferred medium, although I’ve worked in ink and regular pencil as well. Jared: What did you learn during the illustration process? Were there any theological concepts that were new to you or challenged you? Andy: I like the fact that pretty much everything you’d find in a systematic theology book—the Trinity, sin, Hell, the Holy Spirit, etc.—is covered. The book doesn’t shy away from very tough concepts. As a parent of three myself (ages 10, 7, and 4), it’s been good to see that I don’t have to wait until my children are older to share some really tough truths. We can start this foundation at an early age and trust that God will help them understand what he needs them to know. Jared: What did God teach you through the project? Andy: I went into this with a bit of fear and trembling. As I mentioned above, this was the biggest illustration project I’d ever taken on. I was worried how it would affect my time with family and my sleep, since I have a day job as well. Also, I was concerned I might feel overworked, never having a chance to relax. But my wife and I felt like God wanted me to do it, so I jumped in. It turned out, the project was actually a blessing—it invigorated me in a lot of ways. God was directing me all along. Jared: Do you have a favorite illustration? (Is that allowed?) Mine is the earthworm chunk ice cream. Andy: I like the ice cream/earthworm as well. I was also very pleased with the basset hound and the stinky shoe. One thing I thought was kind of playful/fun was to incorporate some repeating images on the clothes of the children (for instance, if you look hard enough, the wormy ice cream cone shows up somewhere else in the book). Jared: There were times when the illustrations in the book seemed to come straight from the text--for example the earthworm chunk ice cream or something more simple like the stolen bike. There were other times when you seemed to take some liberty--like the giant squid hanging on to the NASA rocket (also one of my favorites.) How do you balance that? How often did the ideas come directly from Marty? How often were they more original with you? Andy: Most of the ideas came from Marty, but a few were my own—but always with Marty’s blessing. To be honest, I can no longer remember which were which, and that’s probably good :). But it was fun to put my mark on all the images with little creative bits here and there. After the original sketches were approved, most of the details were up to me. My friends at New Growth encouraged me to be playful, which gave me great freedom within the illustrations. Jared: If other illustrators or authors are reading, what are the top things that illustrators should remember when working with authors? What things should authors remember when working with illustrators? It’s really good to give yourself enough time to do your best. A year and a half was necessary for this, given the amount of time each picture took. That said, when you’re doing something this big (I think we ended up with 115 illustrations), you’re going to have some images you like better than others. You have to be able to live with all of them, but each isn’t going to be your very favorite work, and that’s okay (otherwise, “favorite” has no meaning :) ). I think with something this size, I think you can expect to be thrilled with about a fourth of them, pleased with about half of them, and just “okay” with the remaining fourth. That seems like a good ratio to me. As for what authors should know about working with illustrators—it’s good to give them freedom in the details. I really enjoyed that part of the process as I worked with Marty and the good folks at New Growth. I'm really grateful to Andy for sharing his thoughts and wisdom with us. If you enjoyed or learned from Andy, leave him an encouragement below.